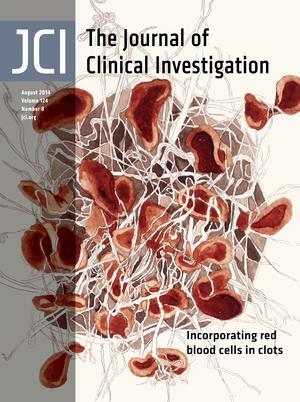 The cover artwork depicts factor XIII, fibrinogen, and red blood cells (rbc) in a clot. On page 3590, Aleman et al. provide evidence that factor XIII plays an active role in recruiting rbc during clot formation. Their study reveals that fibrinogen residues near the factor XIII–binding site are critical for factor XIII activation and further demonstrates that blocking factor XIII activation reduces rbc content of clots. Their work suggests that targeting factor XIII could be an attractive strategy for modulating clot formation. Image credit: Ash Conrad. Citation Information: J Clin Invest. 2014;124(8):3275-3276. https://doi.org/10.1172/JCI77540. Citation Information: J Clin Invest. 2014;124(8):3279-3281. https://doi.org/10.1172/JCI76627. Glutamate excitotoxicity represents a major cellular component of ischemic brain injury. In this issue of the JCI, Soria and colleagues reveal that the cystine/glutamate exchanger is an important source of excitotoxic glutamate in response to ischemia induced by oxygen and glucose deprivation. As the exchanger is a primary determinant of both extracellular glutamate and intracellular glutathione, the findings from this study not only provide important insight into the mechanisms of brain ischemia but also demonstrate the complexity of the yin and yang of glutamate homeostasis and cellular redox balance. Citation Information: J Clin Invest. 2014;124(8):3282-3284. https://doi.org/10.1172/JCI77194. Xerostomia, or dry mouth, is a common side effect of head and neck radiotherapy, Sjögren syndrome, diabetes, old age, and numerous medications. In this issue of the JCI, Xiao and colleagues identified glial cell line–derived neurotrophic factor (GDNF) as a potential stimulus for salivary stem cell growth. Due to its ability to promote neuronal growth, differentiation, and survival, GDNF is currently being used in clinical trials as a treatment for Parkinson disease; therefore, the findings of Xiao and colleagues may initiate a potential treatment for the millions of patients who suffer from xerostomia each year. Citation Information: J Clin Invest. 2014;124(8):3285-3288. https://doi.org/10.1172/JCI77193. Evaluation of potential therapies for neurological disease has been challenging due to beneficial responses in patients receiving the sham/placebo treatment. Placebo effects are especially prominent in Parkinson’s disease (PD), which has become a useful model for studying the neurobiology of placebo responses. In this issue of the JCI, Ko and colleagues identify a neural circuit associated with the placebo response in a PD patient cohort. The observed placebo effect–associated pattern involved metabolic activity increases that corresponded with long-term motor improvements after sham surgery. Presurgery activity in this network was inversely related to sham response, suggesting that this network has potential for identifying sham responders and thus reducing placebo-related variance in surgical trials. Citation Information: J Clin Invest. 2014;124(8):3289-3291. https://doi.org/10.1172/JCI77195. Numerous in vitro studies have shown that human cell lines lacking functional ATM are extremely radiosensitive. In this issue, Moding et al. demonstrate using a murine model of sarcoma that deletion of the Atm gene has much less of a radiosensitizing effect on normal cardiac endothelia than on rapidly proliferating tumor endothelia. This work confounds our assumptions about the generality of the role of ATM in radiation sensitivity and the potential use of ATM inhibitors as radiosensitizers. Islet amyloid and type 2 diabetes: overproduction or inadequate clearance and detoxification? Citation Information: J Clin Invest. 2014;124(8):3292-3294. https://doi.org/10.1172/JCI77506. A hallmark of type 2 diabetes is the reduction of pancreatic islet β cell mass through induction of apoptosis and lack of regeneration. In most patients, β cell dysfunction is associated with the presence of extracellular amyloid plaques adjacent to β cells and intracellular toxic oligomers that are comprised of islet amyloid polypeptide (IAPP). In this issue of the JCI, three independent research groups reveal that a functional autophagy system normally prevents the accumulation of toxic IAPP oligomers in human IAPP–expressing murine models. Furthermore, mice expressing human IAPP but deficient for β cell autophagy through genetic deletion of the autophagy initiator ATG7 developed β cell apoptosis and overt diabetes. Together, these studies indicate that autophagy protects β cells from the accumulation of toxic IAPP oligomers and suggest that enhancing autophagy may be a novel target for prevention of type 2 diabetes. Citation Information: J Clin Invest. 2014;124(8):3295-3310. https://doi.org/10.1172/JCI71668. Tubulointerstitial fibrosis underlies all forms of end-stage kidney disease. TGF-β mediates both the development and the progression of kidney fibrosis through binding and activation of the serine/threonine kinase type II TGF-β receptor (TβRII), which in turn promotes a TβRI-mediated SMAD-dependent fibrotic signaling cascade. Autophosphorylation of serine residues within TβRII is considered the principal regulatory mechanism of TβRII-induced signaling; however, there are 5 tyrosine residues within the cytoplasmic tail that could potentially mediate TβRII-dependent SMAD activation. Here, we determined that phosphorylation of tyrosines within the TβRII tail was essential for SMAD-dependent fibrotic signaling within cells of the kidney collecting duct. Conversely, the T cell protein tyrosine phosphatase (TCPTP) dephosphorylated TβRII tail tyrosine residues, resulting in inhibition of TβR-dependent fibrotic signaling. The collagen-binding receptor integrin α1β1 was required for recruitment of TCPTP to the TβRII tail, as mice lacking this integrin exhibited impaired TCPTP-mediated tyrosine dephosphorylation of TβRII that led to severe fibrosis in a unilateral ureteral obstruction model of renal fibrosis. Together, these findings uncover a crosstalk between integrin α1β1 and TβRII that is essential for TβRII-mediated SMAD activation and fibrotic signaling pathways. Citation Information: J Clin Invest. 2014;124(8):3311-3324. https://doi.org/10.1172/JCI69625. Islet amyloid accumulation is a hallmark of human type 2 diabetes (T2D). In contrast to human islet amyloid polypeptide (hIAPP), murine islet amyloid polypeptide (mIAPP) does not exhibit amyloidogenic propensity. Because autophagy is important in the clearance of amyloid-like proteins, we studied transgenic mice with β cell–specific expression of hIAPP to evaluate the contribution of autophagy in T2D-associated accumulation of hIAPP. In mice with β cell–specific expression of hIAPP, a deficiency in autophagy resulted in development of overt diabetes, which was not observed in mice expressing hIAPP alone or lacking autophagy alone. Furthermore, lack of autophagy in hIAPP-expressing animals resulted in hIAPP oligomer and amyloid accumulation in pancreatic islets, leading to increased death and decreased mass of β cells. Expression of hIAPP in purified monkey islet cells or a murine β cell line resulted in pro-hIAPP dimer formation, while dimer formation was absent or reduced dramatically in cells expressing either nonamyloidogenic mIAPP or nonfibrillar mutant hIAPP. In autophagy-deficient cells, accumulation of pro-hIAPP dimers increased markedly, and pro-hIAPP trimers were detected in the detergent-insoluble fraction. Enhancement of autophagy improved the metabolic profile of hIAPP-expressing mice fed a high-fat diet. These results suggest that autophagy promotes clearance of amyloidogenic hIAPP, autophagy deficiency exacerbates pathogenesis of human T2D, and autophagy enhancers have therapeutic potential for islet amyloid accumulation-associated human T2D. Citation Information: J Clin Invest. 2014;124(8):3325-3338. https://doi.org/10.1172/JCI73932. Cells isolated from patients with ataxia telangiectasia are exquisitely sensitive to ionizing radiation. Kinase inhibitors of ATM, the gene mutated in ataxia telangiectasia, can sensitize tumor cells to radiation therapy, but concern that inhibiting ATM in normal tissues will also increase normal tissue toxicity from radiation has limited their clinical application. Endothelial cell damage can contribute to the development of long-term side effects after radiation therapy, but the role of endothelial cell death in tumor response to radiation therapy remains controversial. Here, we developed dual recombinase technology using both FlpO and Cre recombinases to generate primary sarcomas in mice with endothelial cell–specific deletion of Atm to determine whether loss of Atm in endothelial cells sensitizes tumors and normal tissues to radiation. Although deletion of Atm in proliferating tumor endothelial cells enhanced the response of sarcomas to radiation, Atm deletion in quiescent endothelial cells of the heart did not sensitize mice to radiation-induced myocardial necrosis. Blocking cell cycle progression reversed the effect of Atm loss on tumor endothelial cell radiosensitivity. These results indicate that endothelial cells must progress through the cell cycle in order to be radiosensitized by Atm deletion. Citation Information: J Clin Invest. 2014;124(8):3339-3351. https://doi.org/10.1172/JCI73468. miRNAs are important regulators of biological processes in many tissues, including the differentiation and function of brown and white adipocytes. The endoribonuclease dicer is a major component of the miRNA-processing pathway, and in adipose tissue, levels of dicer have been shown to decrease with age, increase with caloric restriction, and influence stress resistance. Here, we demonstrated that mice with a fat-specific KO of dicer develop a form of lipodystrophy that is characterized by loss of intra-abdominal and subcutaneous white fat, severe insulin resistance, and enlargement and “whitening” of interscapular brown fat. Additionally, KO of dicer in cultured brown preadipocytes promoted a white adipocyte–like phenotype and reduced expression of several miRNAs. Brown preadipocyte whitening was partially reversed by expression of miR-365, a miRNA known to promote brown fat differentiation; however, introduction of other miRNAs, including miR-346 and miR-362, also contributed to reversal of the loss of the dicer phenotype. Interestingly, fat samples from patients with HIV-related lipodystrophy exhibited a substantial downregulation of dicer mRNA expression. Together, these findings indicate the importance of miRNA processing in white and brown adipose tissue determination and provide a potential link between this process and HIV-related lipodystrophy. Citation Information: J Clin Invest. 2014;124(8):3352-3363. https://doi.org/10.1172/JCI75938. Citation Information: J Clin Invest. 2014;124(8):3364-3377. https://doi.org/10.1172/JCI74096. Stem cell–based regenerative therapy is a promising treatment for head and neck cancer patients that suffer from chronic dry mouth (xerostomia) due to salivary gland injury from radiation therapy. Current xerostomia therapies only provide temporary symptom relief, while permanent restoration of salivary function is not currently feasible. Here, we identified and characterized a stem cell population from adult murine submandibular glands. Of the different cells isolated from the submandibular gland, this specific population, Lin–CD24+c-Kit+Sca1+, possessed the highest capacity for proliferation, self renewal, and differentiation during serial passage in vitro. Serial transplantations of this stem cell population into the submandibular gland of irradiated mice successfully restored saliva secretion and increased the number of functional acini. Gene-expression analysis revealed that glial cell line–derived neurotrophic factor (Gdnf) is highly expressed in Lin–CD24+c-Kit+Sca1+ stem cells. Furthermore, GDNF expression was upregulated upon radiation therapy in submandibular glands of both mice and humans. Administration of GDNF improved saliva production and enriched the number of functional acini in submandibular glands of irradiated animals and enhanced salisphere formation in cultured salivary stem cells, but did not accelerate growth of head and neck cancer cells. These data indicate that modulation of the GDNF pathway may have potential therapeutic benefit for management of radiation-induced xerostomia. Citation Information: J Clin Invest. 2014;124(8):3378-3390. https://doi.org/10.1172/JCI74085. Estrogen receptors ERα and ERβ share considerable sequence homology yet exert opposite effects on breast cancer cell proliferation. While the proliferative role of ERα in breast tumors is well characterized, it is not clear whether the antitumor activity of ERβ can be mobilized in breast cancer cells. Here, we have shown that phosphorylation of a tyrosine residue (Y36) present in ERβ, but not in ERα, dictates ERβ-specific activation of transcription and is required for ERβ-dependent inhibition of cancer cell growth in culture and in murine xenografts. Additionally, the c-ABL tyrosine kinase and EYA2 phosphatase directly and diametrically controlled the phosphorylation status of Y36 and subsequent ERβ function. A nonphosphorylatable, transcriptionally active ERβ mutant retained antitumor activity but circumvented control by upstream regulators. Phosphorylation of Y36 was required for ERβ-mediated coactivator recruitment to ERβ target promoters. In human breast cancer samples, elevated phosphorylation of Y36 in ERβ correlated with high levels of c-ABL but low EYA2 levels. Furthermore, compared with total ERβ, the presence of phosphorylated Y36–specific ERβ was strongly associated with both disease-free and overall survival in patients with stage II and III disease. Together, these data identify a signaling circuitry that regulates ERβ-specific antitumor activity and has potential as both a prognostic tool and a molecular target for cancer therapy. Citation Information: J Clin Invest. 2014;124(8):3407-3418. https://doi.org/10.1172/JCI73733. Colorectal cancer is the third most common cancer worldwide. Although the transcription factor c-MYC is misregulated in the majority of colorectal tumors, it is difficult to target directly. The deubiquitinase USP28 stabilizes oncogenic factors, including c-MYC; however, the contribution of USP28 in tumorigenesis, particularly in the intestine, is unknown. Here, using murine genetic models, we determined that USP28 antagonizes the ubiquitin-dependent degradation of c-MYC, a known USP28 substrate, as well as 2 additional oncogenic factors, c-JUN and NOTCH1, in the intestine. Mice lacking Usp28 had no apparent adverse phenotypes, but exhibited reduced intestinal proliferation and impaired differentiation of secretory lineage cells. In a murine model of colorectal cancer, Usp28 deletion resulted in fewer intestinal tumors, and importantly, in established tumors, Usp28 deletion reduced tumor size and dramatically increased lifespan. Moreover, we identified Usp28 as a c-MYC target gene highly expressed in murine and human intestinal cancers, which indicates that USP28 and c-MYC form a positive feedback loop that maintains high c-MYC protein levels in tumors. Usp28 deficiency promoted tumor cell differentiation accompanied by decreased proliferation, which suggests that USP28 acts similarly in intestinal homeostasis and colorectal cancer models. Hence, inhibition of the enzymatic activity of USP28 may be a potential target for cancer therapy. Citation Information: J Clin Invest. 2014;124(8):3419-3430. https://doi.org/10.1172/JCI74523. Mutations in the gene encoding the RNA-binding protein RBM20 have been implicated in dilated cardiomyopathy (DCM), a major cause of chronic heart failure, presumably through altering cardiac RNA splicing. Here, we combined transcriptome-wide crosslinking immunoprecipitation (CLIP-seq), RNA-seq, and quantitative proteomics in cell culture and rat and human hearts to examine how RBM20 regulates alternative splicing in the heart. Our analyses revealed the presence of a distinct RBM20 RNA-recognition element that is predominantly found within intronic binding sites and linked to repression of exon splicing with RBM20 binding near 3′ and 5′ splice sites. Proteomic analysis determined that RBM20 interacts with both U1 and U2 small nuclear ribonucleic particles (snRNPs) and suggested that RBM20-dependent splicing repression occurs through spliceosome stalling at complex A. Direct RBM20 targets included several genes previously shown to be involved in DCM as well as genes not typically associated with this disease. In failing human hearts, reduced expression of RBM20 affected alternative splicing of several direct targets, indicating that differences in RBM20 expression may affect cardiac function. Together, these findings identify RBM20-regulated targets and provide insight into the pathogenesis of human heart failure. Citation Information: J Clin Invest. 2014;124(8):3431-3442. https://doi.org/10.1172/JCI75250. Human T-lymphotropic virus type 1 (HTLV-1) is linked to multiple diseases, including the neuroinflammatory disease HTLV-1–associated myelopathy/tropical spastic paraparesis (HAM/TSP) and adult T cell leukemia/lymphoma. Evidence suggests that HTLV-1, via the viral protein Tax, exploits CD4+ T cell plasticity and induces transcriptional changes in infected T cells that cause suppressive CD4+CD25+CCR4+ Tregs to lose expression of the transcription factor FOXP3 and produce IFN-γ, thus promoting inflammation. We hypothesized that transformation of HTLV-1–infected CCR4+ T cells into Th1-like cells plays a key role in the pathogenesis of HAM/TSP. Here, using patient cells and cell lines, we demonstrated that Tax, in cooperation with specificity protein 1 (Sp1), boosts expression of the Th1 master regulator T box transcription factor (T-bet) and consequently promotes production of IFN-γ. Evaluation of CSF and spinal cord lesions of HAM/TSP patients revealed the presence of abundant CD4+CCR4+ T cells that coexpressed the Th1 marker CXCR3 and produced T-bet and IFN-γ. Finally, treatment of isolated PBMCs and CNS cells from HAM/TSP patients with an antibody that targets CCR4+ T cells and induces cytotoxicity in these cells reduced both viral load and IFN-γ production, which suggests that targeting CCR4+ T cells may be a viable treatment option for HAM/TSP. Citation Information: J Clin Invest. 2014;124(8):3443-3454. https://doi.org/10.1172/JCI73527. Macrophages characterized as M2 and M2-like regulate immune responses associated with immune suppression and healing; however, the relationship of this macrophage subset to CD169+ tissue-resident macrophages and their contribution to shaping alloimmune responses is unknown. Here we identified a population of M2-like tissue-resident macrophages that express high levels of the phosphatidylserine receptor TIM-4 and CD169 (TIM-4hiCD169+). Labeling and tracking of TIM-4hiCD169+ macrophages in mice revealed that this population is a major subset of tissue-resident macrophages, homes to draining LNs following oxidative stress, exhibits an immunoregulatory and hypostimulatory phenotype that is maintained after migration to secondary lymphoid organs, favors preferential induction of antigen-stimulated Tregs, and is highly susceptible to apoptosis. Moreover, CD169+ tissue-resident macrophages were resistant to oxidative stress–induced apoptosis in mice lacking TIM-4. Compared with heart allografts from WT mice, Tim4–/– heart allografts survived much longer and were more easily tolerized by non-immunosuppressed recipients. Furthermore, Tim4–/– allograft survival was associated with the infiltration of Tregs into the graft. Together, our data provide evidence that M2-like TIM-4hiCD169+ tissue-resident macrophages are immunoregulatory and promote engraftment of cardiac allografts, but their influence is diminished by TIM-4–dependent programmed cell death. Citation Information: J Clin Invest. 2014;124(8):3455-3468. https://doi.org/10.1172/JCI66108. During the course of many chronic viral infections, the antiviral T cell response becomes attenuated through a process that is regulated in part by the host. While elevated expression of the immunosuppressive cytokine IL-10 is involved in the suppression of viral-specific T cell responses, the relevant cellular sources of IL-10, as well as the pathways responsible for IL-10 induction, remain unclear. In this study, we traced IL-10 production over the course of chronic lymphocytic choriomeningitis virus (LCMV) infection in an IL-10 reporter mouse line. Using this model, we demonstrated that virus-specific T cells with reduced inflammatory function, particularly Th1 cells, display elevated and sustained IL-10 expression during chronic LCMV infection. Furthermore, ablation of IL-10 from the T cell compartment partially restored T cell function and reduced viral loads in LCMV-infected animals. We found that viral persistence is needed for sustained IL-10 production by Th1 cells and that the transcription factor BLIMP-1 is required for IL-10 expression by Th1 cells. Restimulation of Th1 cells from LCMV-infected mice promoted BLIMP-1 and subsequent IL-10 expression, suggesting that constant antigen exposure likely induces the BLIMP-1/IL-10 pathway during chronic viral infection. Together, these data indicate that effector T cells self-limit their responsiveness during persistent viral infection via an IL-10–dependent negative feedback loop. Citation Information: J Clin Invest. 2014;124(8):3469-3478. https://doi.org/10.1172/JCI73104. Citation Information: J Clin Invest. 2014;124(8):3489-3500. https://doi.org/10.1172/JCI71981. Type 2 diabetes (T2D) is characterized by a deficiency in β cell mass, increased β cell apoptosis, and extracellular accumulation of islet amyloid derived from islet amyloid polypeptide (IAPP), which β cells coexpress with insulin. IAPP expression is increased in the context of insulin resistance, the major risk factor for developing T2D. Human IAPP is potentially toxic, especially as membrane-permeant oligomers, which have been observed to accumulate within β cells of patients with T2D and rodents expressing human IAPP. Here, we determined that β cell IAPP content is regulated by autophagy through p62-dependent lysosomal degradation. Induction of high levels of human IAPP in mouse β cells resulted in accumulation of this amyloidogenic protein as relatively inert fibrils within cytosolic p62-positive inclusions, which temporarily averts formation of toxic oligomers. Mice hemizygous for transgenic expression of human IAPP did not develop diabetes; however, loss of β cell–specific autophagy in these animals induced diabetes, which was attributable to accumulation of toxic human IAPP oligomers and loss of β cell mass. In human IAPP–expressing mice that lack β cell autophagy, increased oxidative damage and loss of an antioxidant-protective pathway appeared to contribute to increased β cell apoptosis. These findings indicate that autophagy/lysosomal degradation defends β cells against proteotoxicity induced by oligomerization-prone human IAPP. Citation Information: J Clin Invest. 2014;124(8):3501-3513. https://doi.org/10.1172/JCI74438. Hepatosteatosis is characterized by an aberrant accumulation of triglycerides in the liver; however, the factors that drive obesity-induced fatty liver remain largely unknown. Here, we demonstrated that the secreted cell adhesion protein periostin is markedly upregulated in livers of obese rodents and humans. Notably, overexpression of periostin in the livers of WT mice promoted hepatic steatosis and hypertriglyceridemia. Conversely, both genetic ablation of periostin and administration of a periostin-neutralizing antibody dramatically improved hepatosteatosis and hypertriglyceridemia in obese mice. Overexpression of periostin resulted in reduced expression of peroxisome proliferator–activated receptor α (PPARα), a master regulator of fatty acid oxidation, and activation of the JNK signaling pathway. In mouse primary hepatocytes, inhibition of α6β4 integrin prevented activation of JNK and suppression of PPARα in response to periostin. Periostin-dependent activation of JNK resulted in activation of c-Jun, which prevented RORα binding and transactional activation at the Ppara promoter. Together, these results identify a periostin-dependent pathway that mediates obesity-induced hepatosteatosis. Citation Information: J Clin Invest. 2014;124(8):3514-3528. https://doi.org/10.1172/JCI74773. Development of the vascular disease pulmonary hypertension (PH) involves disparate molecular pathways that span multiple cell types. MicroRNAs (miRNAs) may coordinately regulate PH progression, but the integrative functions of miRNAs in this process have been challenging to define with conventional approaches. Here, analysis of the molecular network architecture specific to PH predicted that the miR-130/301 family is a master regulator of cellular proliferation in PH via regulation of subordinate miRNA pathways with unexpected connections to one another. In validation of this model, diseased pulmonary vessels and plasma from mammalian models and human PH subjects exhibited upregulation of miR-130/301 expression. Evaluation of pulmonary arterial endothelial cells and smooth muscle cells revealed that miR-130/301 targeted PPARγ with distinct consequences. In endothelial cells, miR-130/301 modulated apelin-miR-424/503-FGF2 signaling, while in smooth muscle cells, miR-130/301 modulated STAT3-miR-204 signaling to promote PH-associated phenotypes. In murine models, induction of miR-130/301 promoted pathogenic PH-associated effects, while miR-130/301 inhibition prevented PH pathogenesis. Together, these results provide insight into the systems-level regulation of miRNA-disease gene networks in PH with broad implications for miRNA-based therapeutics in this disease. Furthermore, these findings provide critical validation for the evolving application of network theory to the discovery of the miRNA-based origins of PH and other diseases. Citation Information: J Clin Invest. 2014;124(8):3529-3539. https://doi.org/10.1172/JCI74994. Nemaline myopathy (NM) is a congenital myopathy that can result in lethal muscle dysfunction and is thought to be a disease of the sarcomere thin filament. Recently, several proteins of unknown function have been implicated in NM, but the mechanistic basis of their contribution to disease remains unresolved. Here, we demonstrated that loss of a muscle-specific protein, kelch-like family member 40 (KLHL40), results in a nemaline-like myopathy in mice that closely phenocopies muscle abnormalities observed in KLHL40-deficient patients. We determined that KLHL40 localizes to the sarcomere I band and A band and binds to nebulin (NEB), a protein frequently implicated in NM, as well as a putative thin filament protein, leiomodin 3 (LMOD3). KLHL40 belongs to the BTB-BACK-kelch (BBK) family of proteins, some of which have been shown to promote degradation of their substrates. In contrast, we found that KLHL40 promotes stability of NEB and LMOD3 and blocks LMOD3 ubiquitination. Accordingly, NEB and LMOD3 were reduced in skeletal muscle of both Klhl40–/– mice and KLHL40-deficient patients. Loss of sarcomere thin filament proteins is a frequent cause of NM; therefore, our data that KLHL40 stabilizes NEB and LMOD3 provide a potential basis for the development of NM in KLHL40-deficient patients. Citation Information: J Clin Invest. 2014;124(8):3540-3550. https://doi.org/10.1172/JCI73061. The cellular response to stress involves the recruitment and coordination of molecular signaling pathways that prevent cell death. D-dopachrome tautomerase (DDT) is an enzyme that lacks physiologic substrates in mammalian cells, but shares partial sequence and structural homology with macrophage migration inhibitory factor (MIF). Here, we observed that DDT is highly expressed in murine cardiomyocytes and secreted by the heart after ischemic stress. Antibody-dependent neutralization of secreted DDT exacerbated both ischemia-induced cardiac contractile dysfunction and necrosis. We generated cardiomyocyte-specific DDT knockout mice (Myh6-Cre Ddtfl/fl), which demonstrated normal baseline cardiac size and function, but had an impaired physiologic response to ischemia-reperfusion. Hearts from Myh6-Cre Ddtfl/fl mice exhibited more necrosis and LV contractile dysfunction than control hearts after coronary artery ligation and reperfusion. Furthermore, treatment with DDT protected isolated hearts against injury and contractile dysfunction after ischemia-reperfusion. The protective effect of DDT required activation of the metabolic stress enzyme AMP-activated protein kinase (AMPK), which was mediated by a CD74/CaMKK2-dependent mechanism. Together, our data indicate that cardiomyocyte secretion of DDT has important autocrine/paracrine effects during ischemia-reperfusion that protect the heart against injury. Citation Information: J Clin Invest. 2014;124(8):3551-3565. https://doi.org/10.1172/JCI75334. Mutations within the gene encoding the DNA helicase RECQL4 underlie the autosomal recessive cancer-predisposition disorder Rothmund-Thomson syndrome, though it is unclear how these mutations lead to disease. Here, we demonstrated that somatic deletion of Recql4 causes a rapid bone marrow failure in mice that involves cells from across the myeloid, lymphoid, and, most profoundly, erythroid lineages. Apoptosis was markedly elevated in multipotent progenitors lacking RECQL4 compared with WT cells. While the stem cell compartment was relatively spared in RECQL4-deficent mice, HSCs from these animals were not transplantable and even selected against. The requirement for RECQL4 was intrinsic in hematopoietic cells, and loss of RECQL4 in these cells was associated with increased replicative DNA damage and failed cell-cycle progression. Concurrent deletion of p53, which rescues loss of function in animals lacking the related helicase BLM, did not rescue BM phenotypes in RECQL4-deficient animals. In contrast, hematopoietic defects in cells from Recql4Δ/Δ mice were fully rescued by a RECQL4 variant without RecQ helicase activity, demonstrating that RECQL4 maintains hematopoiesis independently of helicase activity. Together, our data indicate that RECQL4 participates in DNA replication rather than genome stability and identify RECQL4 as a regulator of hematopoiesis with a nonredundant role compared with other RecQ helicases. Citation Information: J Clin Invest. 2014;124(8):3566-3578. https://doi.org/10.1172/JCI74068. The MAP kinase kinase kinase TGFβ-activated kinase 1 (TAK1) is activated by TLRs, IL-1, TNF, and TGFβ and in turn activates IKK-NF-κB and JNK, which regulate cell survival, growth, tumorigenesis, and metabolism. TAK1 signaling also upregulates AMPK activity and autophagy. Here, we investigated TAK1-dependent regulation of autophagy, lipid metabolism, and tumorigenesis in the liver. Fasted mice with hepatocyte-specific deletion of Tak1 exhibited severe hepatosteatosis with increased mTORC1 activity and suppression of autophagy compared with their WT counterparts. TAK1-deficient hepatocytes exhibited suppressed AMPK activity and autophagy in response to starvation or metformin treatment; however, ectopic activation of AMPK restored autophagy in these cells. Peroxisome proliferator–activated receptor α (PPARα) target genes and β-oxidation, which regulate hepatic lipid degradation, were also suppressed in hepatocytes lacking TAK1. Due to suppression of autophagy and β-oxidation, a high-fat diet challenge aggravated steatohepatitis in mice with hepatocyte-specific deletion of Tak1. Notably, inhibition of mTORC1 restored autophagy and PPARα target gene expression in TAK1-deficient livers, indicating that TAK1 acts upstream of mTORC1. mTORC1 inhibition also suppressed spontaneous liver fibrosis and hepatocarcinogenesis in animals with hepatocyte-specific deletion of Tak1. These data indicate that TAK1 regulates hepatic lipid metabolism and tumorigenesis via the AMPK/mTORC1 axis, affecting both autophagy and PPARα activity. Citation Information: J Clin Invest. 2014;124(8):3579-3589. https://doi.org/10.1172/JCI74370. Citation Information: J Clin Invest. 2014;124(8):3590-3600. https://doi.org/10.1172/JCI75386. Venous thrombi, fibrin- and rbc-rich clots triggered by inflammation and blood stasis, underlie devastating, and sometimes fatal, occlusive events. During intravascular fibrin deposition, rbc are thought to become passively trapped in thrombi and therefore have not been considered a modifiable thrombus component. In the present study, we determined that activity of the transglutaminase factor XIII (FXIII) is critical for rbc retention within clots and directly affects thrombus size. Compared with WT mice, mice carrying a homozygous mutation in the fibrinogen γ chain (Fibγ390–396A) had a striking 50% reduction in thrombus weight due to reduced rbc content. Fibrinogen from mice harboring the Fibγ390–396A mutation exhibited reduced binding to FXIII, and plasma from these mice exhibited delayed FXIII activation and fibrin crosslinking, indicating these residues mediate FXIII binding and activation. FXIII-deficient mice phenocopied mice carrying Fibγ390–396A and produced smaller thrombi with fewer rbc than WT mice. Importantly, FXIII-deficient human clots also exhibited reduced rbc retention. The addition of FXIII to FXIII-deficient clots increased rbc retention, while inhibition of FXIII activity in normal blood reduced rbc retention and produced smaller clots. These findings establish the FXIII-fibrinogen axis as a central determinant in venous thrombogenesis and identify FXIII as a potential therapeutic target for limiting venous thrombosis. Citation Information: J Clin Invest. 2014;124(8):3601-3611. https://doi.org/10.1172/JCI74134. Direct interaction of RAS with the PI3K p110α subunit mediates RAS-driven tumor development: however, it is not clear how p110α/RAS-dependant signaling mediates interactions between tumors and host tissues. Here, using a murine tumor cell transfer model, we demonstrated that disruption of the interaction between RAS and p110α within host tissue reduced tumor growth and tumor-induced angiogenesis, leading to improved survival of tumor-bearing mice, even when this interaction was intact in the transferred tumor. Furthermore, functional interaction of RAS with p110α in host tissue was required for efficient establishment and growth of metastatic tumors. Inhibition of RAS and p110α interaction prevented proper VEGF-A and FGF-2 signaling, which are required for efficient angiogenesis. Additionally, disruption of the RAS and p110α interaction altered the nature of tumor-associated macrophages, inducing expression of markers typical for macrophage populations with reduced tumor-promoting capacity. Together, these results indicate that a functional RAS interaction with PI3K p110α in host tissue is required for the establishment of a growth-permissive environment for the tumor, particularly for tumor-induced angiogenesis. Targeting the interaction of RAS with PI3K has the potential to impair tumor formation by altering the tumor-host relationship, in addition to previously described tumor cell–autonomous effects. Citation Information: J Clin Invest. 2014;124(8):3612-3616. https://doi.org/10.1172/JCI75214. The transmission of pruritoceptive (itch) messages involves specific neural circuits within the spinal cord that are distinct from those that transmit pain messages. These itch-specific circuits are tonically regulated by inhibitory interneurons in the dorsal horn. Consistent with these findings, it has previously been reported that loss of GABAergic interneurons in mice harboring a deletion of the transcription factor Bhlhb5 generates a severe, nonremitting condition of chronic itch. Here, we tested the hypothesis that the neuropathic itch in BHLHB5-deficient animals can be treated by restoring inhibitory controls through spinal cord transplantation and integration of precursors of cortical inhibitory interneurons derived from the embryonic medial ganglionic eminence. We specifically targeted the transplants to segments of the spinal cord innervated by areas of the body that were most severely affected. BHLHB5-deficient mice that received transplants demonstrated a substantial reduction of excessive scratching and dramatic resolution of skin lesions. In contrast, the scratching persisted and skin lesions worsened over time in sham-treated mice. Together, these results indicate that cell-mediated restoration of inhibitory controls has potential as a powerful, cell-based therapy for neuropathic itch that not only ameliorates symptoms of chronic itch, but also may modify disease. Citation Information: J Clin Invest. 2014;124(8):3617-3633. https://doi.org/10.1172/JCI75436. Interactions between the host and gut microbial community likely contribute to Crohn disease (CD) pathogenesis; however, direct evidence for these interactions at the onset of disease is lacking. Here, we characterized the global pattern of ileal gene expression and the ileal microbial community in 359 treatment-naive pediatric patients with CD, patients with ulcerative colitis (UC), and control individuals. We identified core gene expression profiles and microbial communities in the affected CD ilea that are preserved in the unaffected ilea of patients with colon-only CD but not present in those with UC or control individuals; therefore, this signature is specific to CD and independent of clinical inflammation. An abnormal increase of antimicrobial dual oxidase (DUOX2) expression was detected in association with an expansion of Proteobacteria in both UC and CD, while expression of lipoprotein APOA1 gene was downregulated and associated with CD-specific alterations in Firmicutes. The increased DUOX2 and decreased APOA1 gene expression signature favored oxidative stress and Th1 polarization and was maximally altered in patients with more severe mucosal injury. A regression model that included APOA1 gene expression and microbial abundance more accurately predicted month 6 steroid-free remission than a model using clinical factors alone. These CD-specific host and microbe profiles identify the ileum as the primary inductive site for all forms of CD and may direct prognostic and therapeutic approaches. Citation Information: J Clin Invest. 2014;124(8):3634-3644. https://doi.org/10.1172/JCI69866. Pancreatic islets in patients with type 2 diabetes mellitus (T2DM) are characterized by loss of β cells and formation of amyloid deposits derived from islet amyloid polypeptide (IAPP). Here we demonstrated that treatment of INS-1 cells with human IAPP (hIAPP) enhances cell death, inhibits cytoproliferation, and increases autophagosome formation. Furthermore, inhibition of autophagy increased the vulnerability of β cells to the cytotoxic effects of hIAPP. Based on these in vitro findings, we examined the pathogenic role of hIAPP and its relation to autophagy in hIAPP-knockin mice. In animals fed a standard diet, hIAPP had no toxic effects on β cell function; however, hIAPP-knockin mice did not exhibit a high-fat-diet–induced compensatory increase in β cell mass, which was due to limited β cell proliferation and enhanced β cell apoptosis. Importantly, expression of hIAPP in mice with a β cell–specific autophagy defect resulted in substantial deterioration of glucose tolerance and dispersed cytoplasmic expression of p62-associated toxic oligomers, which were otherwise sequestrated within p62-positive inclusions. Together, our results indicate that increased insulin resistance in combination with reduced autophagy may enhance the toxic potential of hIAPP and enhance β cell dysfunction and progression of T2DM. Citation Information: J Clin Invest. 2014;124(8):3645-3655. https://doi.org/10.1172/JCI71886. During brain ischemia, an excessive release of glutamate triggers neuronal death through the overactivation of NMDA receptors (NMDARs); however, the underlying pathways that alter glutamate homeostasis and whether synaptic or extrasynaptic sites are responsible for excess glutamate remain controversial. Here, we monitored ischemia-gated currents in pyramidal cortical neurons in brain slices from rodents in response to oxygen and glucose deprivation (OGD) as a real-time glutamate sensor to identify the source of glutamate release and determined the extent of neuronal damage. Blockade of excitatory amino acid transporters or vesicular glutamate release did not inhibit ischemia-gated currents or neuronal damage after OGD. In contrast, pharmacological inhibition of the cystine/glutamate antiporter dramatically attenuated ischemia-gated currents and cell death after OGD. Compared with control animals, mice lacking a functional cystine/glutamate antiporter exhibited reduced anoxic depolarization and neuronal death in response to OGD. Furthermore, glutamate released by the cystine/glutamate antiporter activated extrasynaptic, but not synaptic, NMDARs, and blockade of extrasynaptic NMDARs reduced ischemia-gated currents and cell damage after OGD. Finally, PET imaging showed increased cystine/glutamate antiporter function in ischemic rats. Altogether, these data suggest that cystine/glutamate antiporter function is increased in ischemia, contributing to elevated extracellular glutamate concentration, overactivation of extrasynaptic NMDARs, and ischemic neuronal death. Citation Information: J Clin Invest. 2014;124(8):3656-3666. https://doi.org/10.1172/JCI75073. Patient responses to placebo and sham effects are a major obstacle to the development of therapies for brain disorders, including Parkinson’s disease (PD). Here, we used functional brain imaging and network analysis to study the circuitry underlying placebo effects in PD subjects randomized to sham surgery as part of a double-blind gene therapy trial. Metabolic imaging was performed prior to randomization, then again at 6 and 12 months after sham surgery. In this cohort, the sham response was associated with the expression of a distinct cerebello-limbic circuit. The expression of this network increased consistently in patients blinded to treatment and correlated with independent clinical ratings. Once patients were unblinded, network expression declined toward baseline levels. Analogous network alterations were not seen with open-label levodopa treatment or during disease progression. Furthermore, sham outcomes in blinded patients correlated with baseline network expression, suggesting the potential use of this quantitative measure to identify “sham-susceptible” subjects before randomization. Indeed, Monte Carlo simulations revealed that a priori exclusion of such individuals substantially lowers the number of randomized participants needed to demonstrate treatment efficacy. Individualized subject selection based on a predetermined network criterion may therefore limit the need for sham interventions in future clinical trials. Citation Information: J Clin Invest. 2014;124(8):3667-3677. https://doi.org/10.1172/JCI75730. Citation Information: J Clin Invest. 2014;124(8):3678-3678. https://doi.org/10.1172/JCI77652.